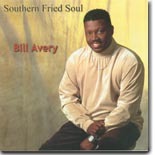 The sparse liner notes to Southern Fried Soul tell us that Bill Avery was born and raised in Gadsen, Alabama and that his second cousin is Beyonce Knowles of Destiny's Child. I would have to say that, after several listens, this is one of the best CDs from a relative newcomer this year. The CD opens with a mid-paced "Can't Get Enough," a well-produced song with excellent back up singers and a hint of real musicians. "Time," one of the seven tunes penned by Avery, is just a good Southern soul song, and if one of these newer tracks is getting some radio play, I'll bet it's this one. Of the two covers, Eddie Floyd's "Knock On Wood" is a great song that gives Avery's voice a chance to shine. The other cover, "Nine Pound Steel," had me digging for my copy of the original by Joe Simon. This is a great overlooked prison song (it made it to #19 R&B in 1967), and whoever decided to cover this song on this album is brilliant. It takes this release to the next level. Dan Penn is such a great songwriter and this is one of his best. "Stuck On You" ends this release on a high note, with this finely crafted song with its spoken interlude. Not a bad track here, so this new release gets nothing but the highest praise. If you love Southern soul the way I do, you're gonna want to own this one.